Want to learn more about the Battle of Williamsburg, the occupation of the town, or the complete Peninsula Campaign? We suggest the following books for your further reading. Published in 1997, this book represents the first full-length study of the Battle of Williamsburg as more than just a rear guard action or skirmish during the Peninsula Campaign of 1862. A Pitiless Rain gives the battle its due importance. The book derives its name from Lt. Colonel Coyne of the 70th NY, who observed that the dead on the battlefield “lying in the pitiless rain” were insensible to the horrible sights and sounds of battle raging around them. WBA director and local author and historian, Carson O. Hudson, Jr. published his first book on Williamsburg during the Civil War in 1997. After a summary of the battle, the book focuses on events in Williamsburg that occurred during the May 5 battle and the three years of Union occupation afterwards. Readers will see and experience a Williamsburg largely forgotten and rarely talked about. You can purchase this book through Amazon. Mr. Hudson followed up his first book on Williamsburg during the Civil War with this work in 2016. The collection of stories, anecdotes, and trivia in the book add color and texture to a 19th century Williamsburg and its citizens that are mostly lost in the shadows of the restored 18th century town. This book, too, is available through Amazon. Ms. Dubbs' interest in the Civil War began while a student at the College of William & Mary. 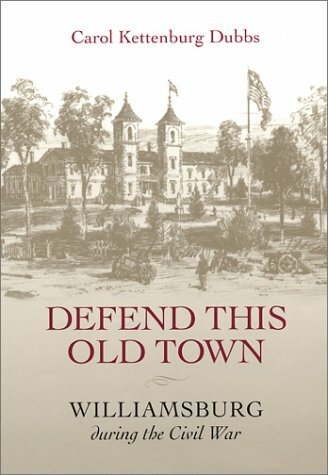 Her writings on Williamsburg during the war began as a thesis and, with the encouragement of professors and others, culminated with publication of Defend This Old Town in 2002. The book is an in-depth presentation of the harsh and sometimes humorous events experienced by the soldiers and citizens of Williamsburg from 1861-1865. Mr. Sears has written multiple, award-winning books on the Civil War and is regarded as one of the finest author's on the subject. Published in 1992, To the Gates of Richmond is a comprehensive military history of the Peninsula Campaign, the largest campaign of the Civil War. The author does not brush aside the fighting outside Williamsburg and provides a compelling account of the first, pitched battle of the campaign.